Q: What famous sports figure was diagnosed with amyotrophic lateral sclerosis (ALS) and brought national attention to the disease? Lou Gehrig (1903 – 1941) began playing baseball for the New York Yankees in 1923, playing along with the baseball greats Babe Ruth and Joe DiMaggio. In 1934, Gehrig led the league in RBIs (runs batted in), home runs and batting average – the “triple crown” of baseball. During Gehrig’s career on the team, the Yankees won six World Series championships. In 1938 Gehrig was diagnosed with amyotrophic lateral sclerosis (ALS) and retired from baseball. Gehrig’s diagnosis brought national attention to ALS which was referred to as “Lou Gehrig’s Disease” for many years. Lou Gehrig died on June 2, 1941, sixteen years to the day of becoming first baseman for the New York Yankees. 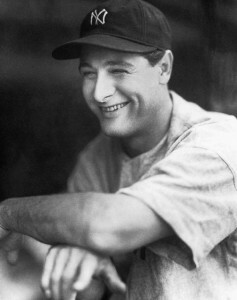 You can learn more about Lou Gehrig on Wikipedia; and learn more about ALS at www.ALS.org.